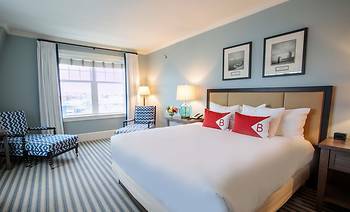 Beauport Hotel Gloucester, Gloucester, United States of America - Lowest Rate Guaranteed! Your staff is exceptional! Everyone at the front desk was so friendly and happy. Bob Meehan could not have done more to make our stay pleasant, making suggestions for touring and recommendations from your restaurant! We had both lunch on Saturday and brunch on Sunday in the 1606 restaurant....delicious! The entire weekend was magical! This was my Christmas gift to my boyfriend and YOU made ME look good! Thank you so much! It was perfect! The holiday decorations and the $15. Coupon toward a meal. The lovely corner room with fab views was busy during the night as truckers kept turning on their engines to warm up their vehicles. So, a bit noisy for my taste. Sleeping with crashing waves. Lounge bar very comfortable. Excellent color decorations and nautical motif. Oatmeal should be on the breakfast menu. Nice accommodations, close to businesses in the area. We enjoyed the pool and hot tub on the roof, the fire pit and the room. Everyone was very friendly and helpful. We love the roof deck pool and bar. The shuttle is awesome. We don’t love the menu at the restaurant or the pool bar. We opted to go out for breakfast and dinner at other spots. It was amazing! It was a girls night out and we didn’t leave the hotel we were so comfortable just hanging out at the bar and in our room! The hotel is beautiful. The staff is very nice.